The method we use at Crown Point Press for tearing down our prints allows you to get really nice, clean margins with a crisp torn edge. We use a stainless steel tear bar, and we sell the 24-inch bar in our bookstore and also online. See here. Nearly 100% of the time we print on slightly oversized paper and then tear down the prints after they have been dried and flattened. Having excess paper allows us handling room when we are printing. 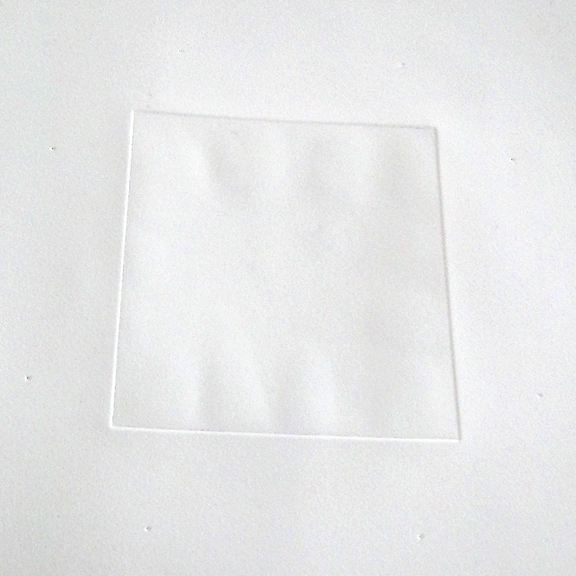 If any fingerprints wind up on the edges of the paper they can later be torn away. There are other reasons not to print on paper that is the exact dimension of the finished print, as it is very difficult to get the paper lined up perfectly and, if we are printing multiple-plate images, the paper must be oversized on the top and bottom in order to catch it underneath the press roller for registration reasons. This means that the excess paper needs to be torn away to the desired print size. We have two methods for tearing down our prints. The first I’ll call the Ruler Pinhole Method. It is good if you just need to tear down a few prints. 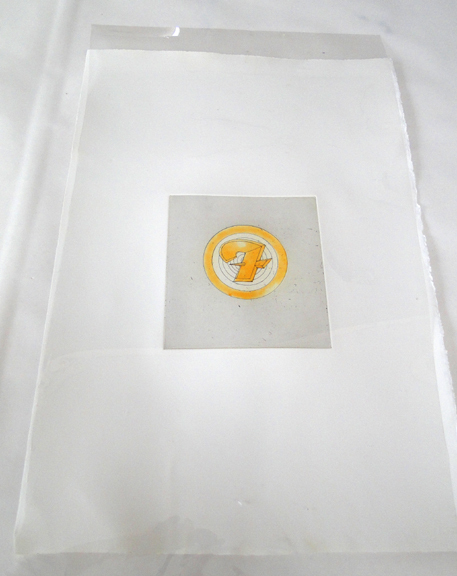 The second, the Mylar Pinhole Method, is useful if you have a large number of prints to tear down or if all of the prints need to be the exact same size. This is especially useful if you are tearing down prints that will be presented together in a portfolio or something like that. 1. Print your image on a sheet of paper that is slightly oversized. 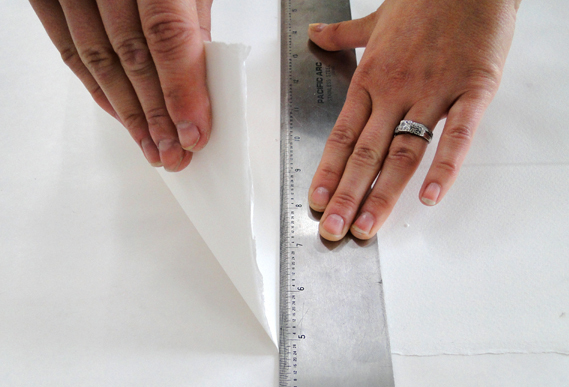 It will need to be at least 1-2 inches bigger all around in order to tear the paper correctly. 3. Decide on your finished margin sizes. Most of the margins on prints at Crown Point Press are slightly larger on the bottom with the top and sides the same. For example, the top and side margins could be 3″ and the bottom margin 4″ Add 1/16″ to the margin dimension you decide on. This will allow you to tear away the pinholes you’ll be making in the paper in the next step. 4. Set your print face up on a clean surface with a piece of mat board, foam core, or something similar. Just be sure that it is thick enough for a thumbtack to pass through. 5. 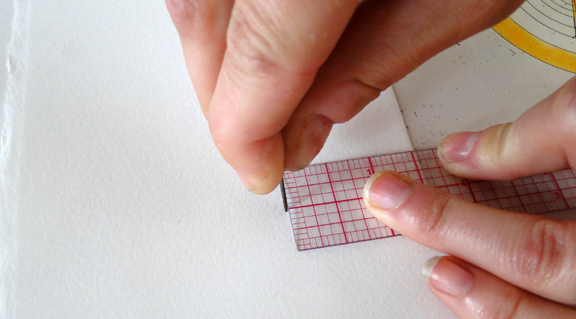 Using a plastic ruler, measure out your pre determined margin size (remember to include the extra 1/16″) and then use a clean thumbtack to punch through the paper right above the ruler line. For each margin make two marks: one to the far left of the image and one to the far right. 6. Repeat this process for all of the sides. 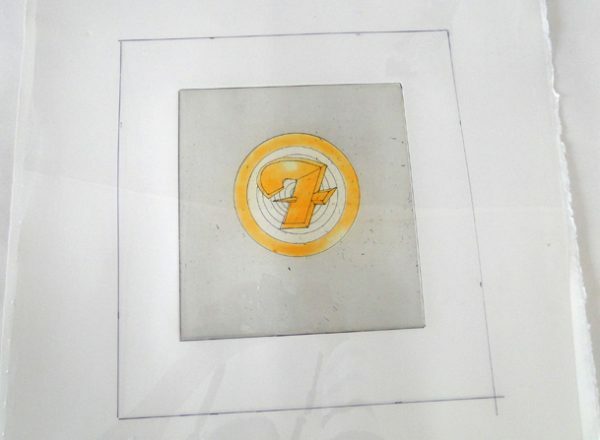 You should have a total of 8 pinholes in the print, 4 on each side. 7. Turn your print face down. 8. Choose a side to start with and line up your tear-bar against the two pinholes you punched for that side. Place the tear bar about 1/16″ out from the actual pinhole so that you tear the pinhole away. 9. Hold the bar firmly with one hand and use the other hand to tear the paper against the bar. Be sure to use short, firm strokes in order to get a good crisp tear. After you tear the excess paper away, you’ll see that the pinholes have been torn away and that the margin is the exact size you wanted. 10. Use the same method to tear away the remaining three edges. 1. Follow steps 1-4 as outlined above. 2. 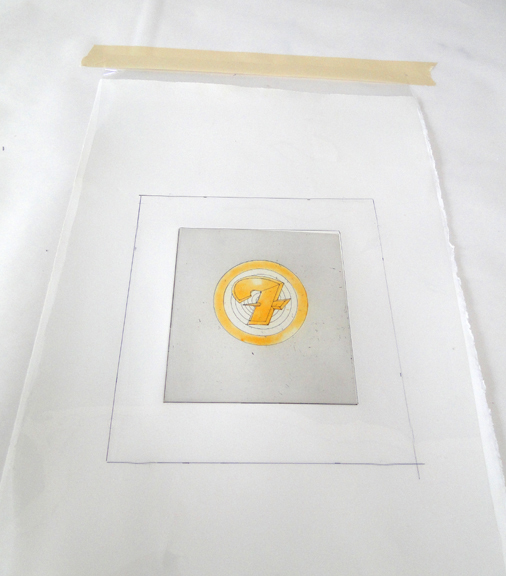 Place a piece of Mylar over your print. It should be a few inches bigger than your paper size. 3. Use a thin sharpie pen to draw the edges of your image. 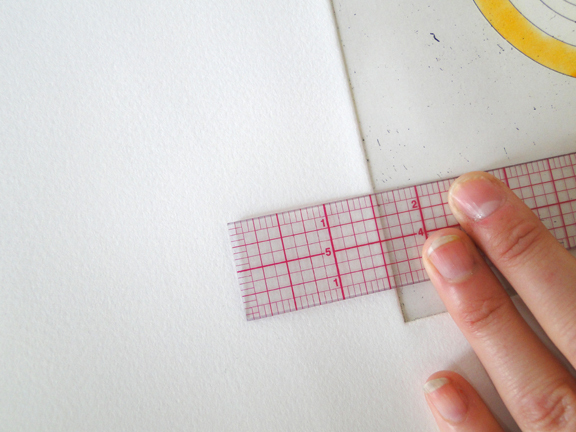 Use a straight edge to get a crisp, accurate line. 4. Measure out the desired margin size from the drawn image edges. Make two marks for each side, one on the far left and one on the far right of the image. Add 1/16″, as mentioned above in step 3. 5. After you’ve made the marks for all of the sides use a straight edge and a sharpie to connect them. 6. 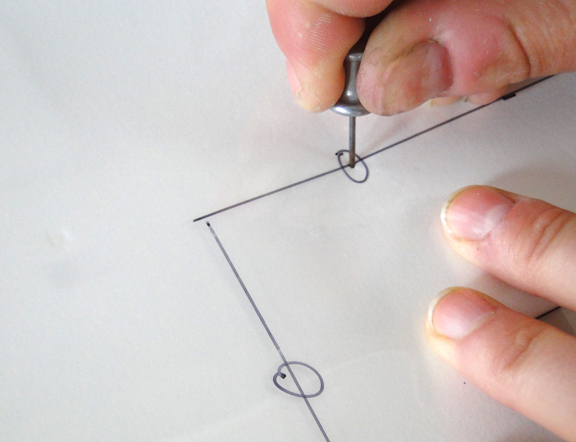 Use a square to make sure that the drawn margin lines are square. 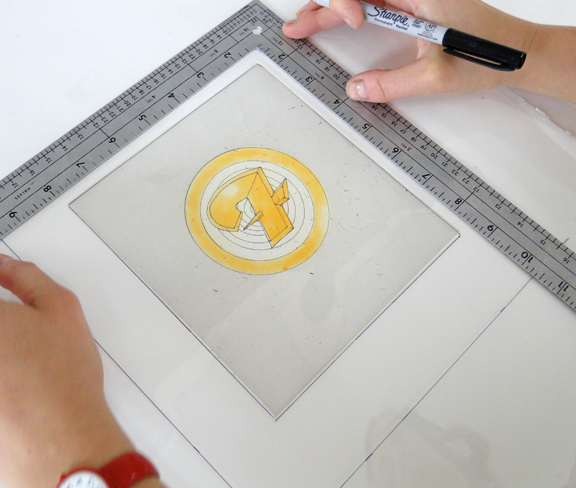 7.Line up your image within the drawn image area on the Mylar. 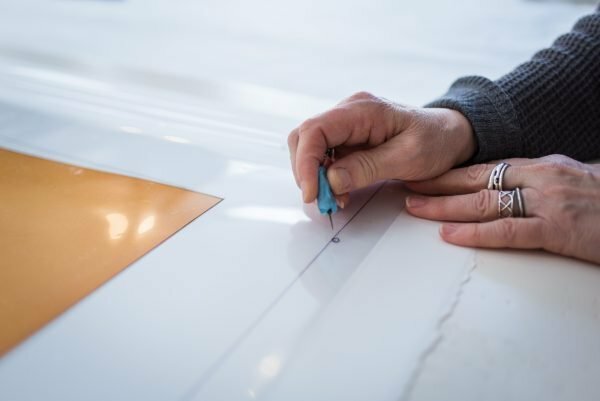 Tape down one edge of the Mylar with masking tape so the Mylar doesn’t slip around when you’re lining up the print or sticking it with the thumbtack. 8. 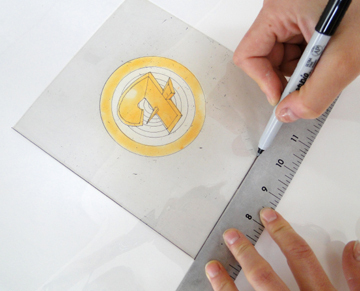 Use a clean thumbtack to punch through the paper and the Mylar in the area you have marked. For each side make two punches: one to the far left of the image and one to the far right. 9. 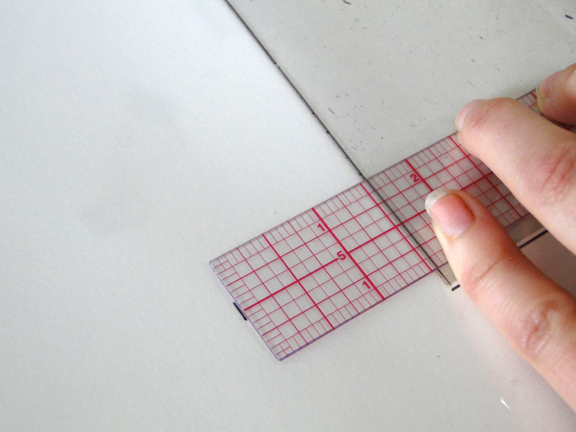 Follow steps 7-10 as listed in The Ruler Pinhole Method to tear down your print. Since everything has already been measured out on the Mylar, you can continue tearing down more prints without having to measure again.